It’s Friday morning and I meet my fellow Tai Chi practitioners in the park. As we stand silently among the budding rose bushes and almond trees, I struggle to empty my mind. I feel nervous. Will I be able to get through the form? Will the others notice my trembling hands? Will I lose my balance while doing the kicks? 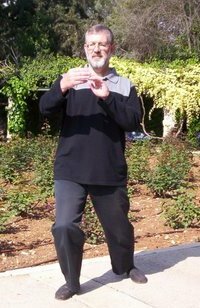 My Tai Chi instructor, Arieh Breslow, slowly takes a deep breath, exhales and sinks into his right leg. We all begin to follow as he starts the form. I take a deep breath of the cool Jerusalem air and exhale as I sink, telling myself to relax, relax. As I progress through the form, I begin to gain confidence in my body. Breathing deeply, sinking, flowing, relaxing, releasing tension, I realize that I can still do this. I feel good. I feel wonderful. Starting the form was not always filled with such trepidation. There was a time when I felt completely confident. But, Parkinson’s disease has changed that. I had my first symptoms of Parkinson’s at the age of 49. My left shoulder wasn’t moving easily during warm-up exercises and my left hand wasn’t always in the correct position when doing the Tai Chi form. At first, I shrugged it off as stiffness. A year later I developed a small tremor in my left hand and my arm didn’t swing properly when I walked. It was then that I decided to see a neurologist - I was diagnosed with Parkinson’s disease. I knew that if I wanted to maintain a high quality of life, I would need to develop a program for coping with this disease. My doctor prescribed a cocktail of medications for reducing my symptoms, with a myriad of side effects. This prompted me to investigate alternative approaches that would allow me to function as normally as possible. My medical journey led me into Chinese herbal medicine and Ayurvedic treatments from a doctor in India, pressure-point massage and acupuncture from a Tibetan monk, and Yoga lessons. Although these treatments gave me some relief, I felt that none of them could match the combination of proper medication and Tai Chi. Today, my personal program is based on three pillars: medication, exercise (with Tai Chi as the basis), and a low-fat vegetarian diet high in antioxidants to protect and boost my remaining brain cells. The program is by no means static - I constantly adjust it to my changing medical condition. Over time, I’ve noticed the accumulative effects of my health regimen. A good Tai Chi workout seems to be as effective for me as taking a pill and the results of a session last for hours. · Preventing falls and developing flexibility - The constant sinking, turning, and shifting of weight in the Tai Chi form gives a tremendous workout to the legs and lower body. The constant transition from move to move stretches the hip and groin area strengthening the muscles and joints. Each stance ends with roots sunk deep into the ground, while remaining flexible like a tree in the wind. · Balance - In Tai Chi, proper alignment of the body is obtained by tucking in the chin, raising the back of the neck slightly, and elongating the spine as if it is suspended from the top of the head like a string of pearls. This “string” imagery relieves the stress on the back muscles, relaxes the shoulders and improves posture and balance. · Rigidity and freezing - It is not unusual for Parkinson’s people to experience rigidity or to suddenly become frozen when walking. Concentrating on flowing like a river in the form produces beautiful even movements that are thrilling to experience. Through Tai Chi, I get a sense of accomplishment and well being, knowing that I can still function relatively well and, in some cases better, than a person with no physical limitations. It has given me an acute awareness of my body, which parts are not aligned and how to bring them back into the whole of the body so that it functions as one unit. Tai Chi has helped me to cope with Parkinson’s and has heightened my enjoyment of life.